Veterans take a trip through history via WWII aircrafts. 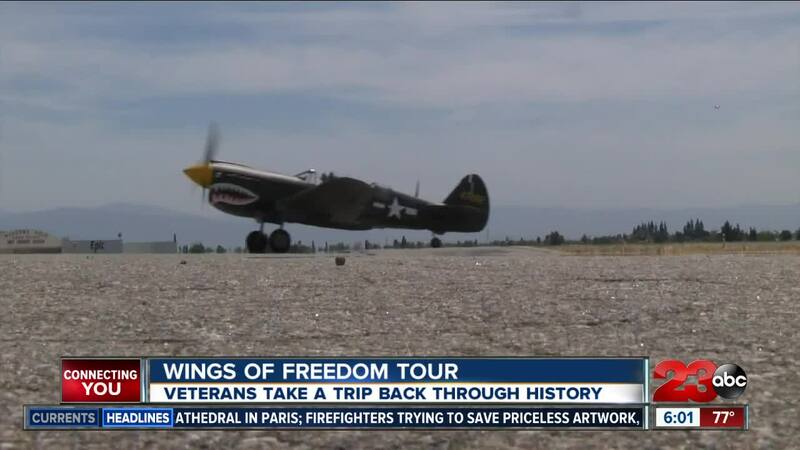 BAKERSFIELD, Calif. — Veterans and aviation enthusiasts are heading to the Meadows Field Airport to experience The Wings of Freedom Tour, where aircraft used in World War II are available for viewing and riding. This is the non-profits first time in Bakersfield in almost a decade. The organization wants to educate communities and remember local veterans like John Close. “There are a lot of emotions involved in this,” said Close. Close, a local Korean war veteran, and his wife Susan experienced the Warbirds used in WWII thanks to the Wings of Freedom Tour. “I was born in 1933, so I was right in the middle of the second war and those planes and all those things associated with them,” said Close. The couple along with other attendees walked through one of four aircraft on display at Meadows Field. Jamie Mitchell, coordinator for Wings of Freedom, is also offering flight training and rides on the planes. All funds received will go to the maintenance of these aircraft and funding the tours across the country. The tour is also home to one of the only aircraft of its kind left in the world, all while celebrating its 30th anniversary. “We have the world's only B-25 Liberator which is common among veterans from the South Pacific that flew during the war,” said Mitchell. The last time the event took place here in Bakersfield was almost a decade ago. “It’s history an activated generated history right before your eyes these airplanes did magnificent things,” said Close. You can catch the Wings of Freedom tour at the Bakersfield Jet center until this Wednesday. For more information and tickets prices, follow this link.